Honda's model range has always been somewhat hamstrung by a lack of engines. So it's no surprise to see the firm making a big deal of its new 1.6 i-DTEC diesel. 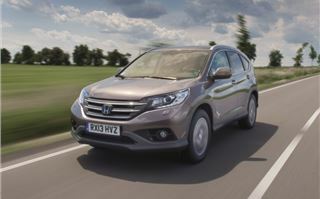 It was launched in the Civic earlier this year and is now being added to the CR-V line-up, alonsgide the excellent 2.2 i-DTEC and the 2.0-litre petrol i-VTEC. This still means only three engine choices in the CR-V but it's a key engine as Honda aims to widen the appeal of its SUV, particularly with company car drivers. Many fleets have a CO2 cap of 130g/km and won't list 4x4s so that explains why the 1.6 i-DTEC comes as two-wheel drive only, making an immediate weight and fuel saving. The engine is also considerably lighter than the larger 2.2-litre unit and overall the 1.6 i-DTEC model is 116kg lighter - a huge weight saving. As a result CO2 drops to 119g/km putting it in VED Band C while claimed economy is up to 62.8mpg. Compare this to the 2.2 i-DTEC which averages an official 50.4mpg (in the entry-level versions) with CO2 of 149g/km and it's easy to see why it will appeal to those wanting a cheap(er) to run SUV. There's no visual difference between the 1.6 i-DTEC and any other CR-V (although there's no top EX trim version). Honda doesn't do engine badging or big showy exhausts and everything else is identical. So you won't feel short changed for choosing a lower power model. The CR-V is a good looking SUV - one of the best in our opinion - with an upmarket and sleek appearance. SR models come with polished chrome 18-inch alloy wheels which suit it really well and don't harm the ride too much either. With 120PS the 1.6 i-DTEC doesn't look like a ball of fire on paper but the key is its 300Nm of torque which means it pulls well in gear, provided you keep the revs around the 2500rpm mark. Around town it's fine and will happily cruise along the motorway, but unlike the 2.2 i-DTEC, with 150PS and 350Nm of torque, you can't just leave it in sixth gear and let it do all the work. More often than not you need to change down if you want meaningful acceleration, which doesn't do the fuel economy any good. It can also get somewhat noisy at higher revs, not that it's really the kind of car you're going to be thrashing around. But on hilly roads, with a full load on board, it needs to be worked considerably harder than the 2.2 i-DTEC. It's a little strange in traffic too, needing more revs than you'd expect to pull smoothly away from a standstill. So, isn't this just a CR-V - a car we already rate highly - with a lower powered engine? Well actually it's more than that. Honda has made some significant changes to the handling and suspension with softer springs at the front and stiffer damper settings. The result is that it's more agile than the 2.2 i-DTEC and far better in corners with less body roll and a sharper feel to the steering. The ride quality has been sacrificed but only marginally so the majority of the time you won't notice. Only very poor roads highlight the difference, giving it the same refined and smooth riding feel as the rest of the CR-V range. The question here is: why make the lower powered diesel the better car to drive? We'd have thought the 2.2 i-DTEC would have been the better model to get the sportier set-up. Inside the CR-V is a cut above other SUVs at this price, with a high quality and sophisticated interior that's superbly finished. There's a real finesse and precision to all the controls and we really like the nice high-mounted gear lever close to the steering wheel. The driving position is excellent too, giving you a raised view out of the car without feeling like you're sitting on top the steering wheel. Those big mirrors make parking easy too. It has a huge boot too and the large opening and flat load lip makes getting thing like pushchairs and bikes in and out easy. There is also excellent rear passenger space and very comfortable seats. As a high quality family SUV with an upmarket feel, the CR-V is right on the money. And taking of money, Honda has yet to confirm prices for the 1.6 i-DTEC but it has indicated that they'll start at around £22,000. That's around £2500 cheaper than an equivalent 2.2 i-DTEC so it looks decent value. However there's some strong competition in this market, the Mazda CX-5 being a prime example. Even though it has a larger 2.2-litre diesel engine with 150PS and more torque, it emits just 119g/km of CO2 and averages a claimed 61.4mpg. And at £22,995 for the entry-level SE-L version it's not much more. Whether the CX-5 has the same image as the CR-V we're not so sure. Certainly the Honda has a better interior and more upmarket feel and Honda owners tend to be a loyal bunch. 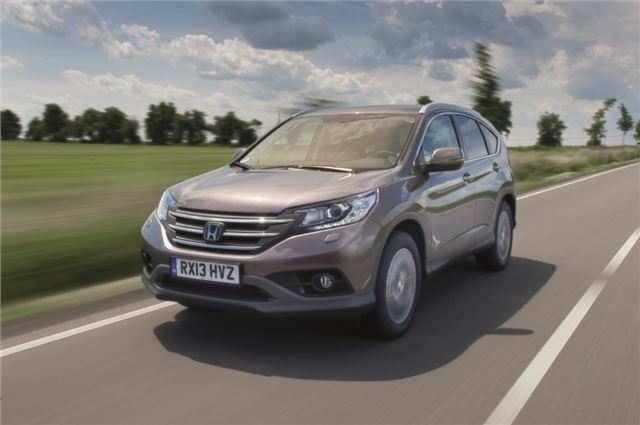 The 1.6 i-DTEC certainly widens the appeal of the CR-V, especially with company car drivers, while the strong fuel economy figures are good news if you want an affordable to run but practical family SUV.